A new study suggests that the most frequent workplace injuries these days actually have less to do with violence, car accidents, or exposure to chemicals than may be anticipated. Around 60 percent of nonfatal injuries reported in 2016 occurred because of common, everyday mistakes. Since these kinds of injuries can be prevented with care and planning, CPI Security sought to provide a workable list of the most frequent injuries and their causes to help businesses make suitable changes. Madison.com reports that the data used in the ranking was from the Bureau of Labor Statistics and included only nonlethal injuries that led to missed work days. The study did not include the self-employed, workers on small farms (10 or fewer people), private household workers, volunteers, or federal government workers. As such, it is a solid guide, but not an exhaustive one. 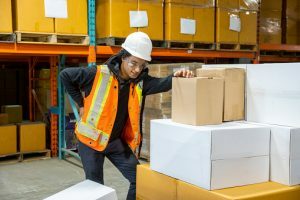 The study identified the eight most frequent types of workplace injury and the most common event causing that kind of injury. This summary will begin with the eighth most frequent injury type and count down to the first. Resulting most frequently from exposure to hazardous substances or environments, heat and thermal burns affected 1.4 out of every 10,000 full-time workers. Injuries of this type had a median period of 6 days off work per case, resulting in a loss of 94,020 days of work lost per year. Puncture wounds, excluding gunshot wounds, were most often the result of contact with equipment or objects on the job. The median days off work per case was only 3, but because they afflicted 1.6 per 10,000 full-time workers, injuries of this type accounted for 53,040 days of work lost per year. Also generally caused by contact with equipment or objects at work, concussions add up to 130,760 days of work lost per year. This is a result of a rate of 1.7 incidents per 10,000 full-time workers with the median period of work lost at 7 days per case. The third of four injury types caused by contact with objects and equipment on the list, lacerations keep workers off the job for a median of 3 days per case for a total of 259,920 days lost per year. These injuries affect 7.8 per 10,000 full-time workers. Fractures are the only entry on the list most frequently caused by slips, falls, and trips. 8.5 per 10,000 full-time workers suffered a fracture, with a median time of 32 days off work, for a total of 3,041,920 days of work lost per year. At a rate of 8.8 injuries per 10,000 full-time workers, contusions are the most common of the injury types commonly caused by contact with objects and equipment at work. The median of 4 days of work lost per case added up to 391,840 days off per year. The top two injuries are most often caused by overexertion and bodily reaction. Claiming 20.3 of every 10,000 full-time workers at a median of 7 days away from work, nonspecified injuries and disorders (usually soreness and swelling) totaled 1,586,340 days of work lost per year. Sprains, strains, and tears kept workers off the job for a median of 10 days per case for a total of 4,062,000 days lost per year. These injuries claimed the top spot by affecting 36.3 per 10,000 full-time workers. If you have suffered a workplace injury, contact us today to learn how we can help you get back on your feet.